Rhojean McClure and Jennifer Harrison received Best of Show honors for their respective entries. 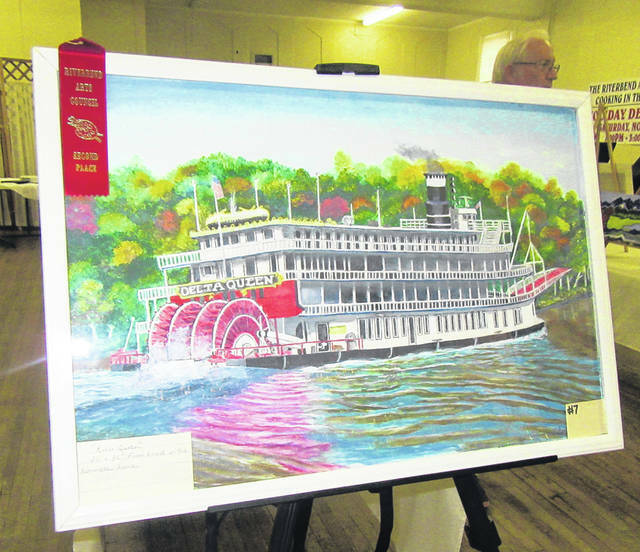 “River Queen” by Charles Tate took second place in the water color painting category. 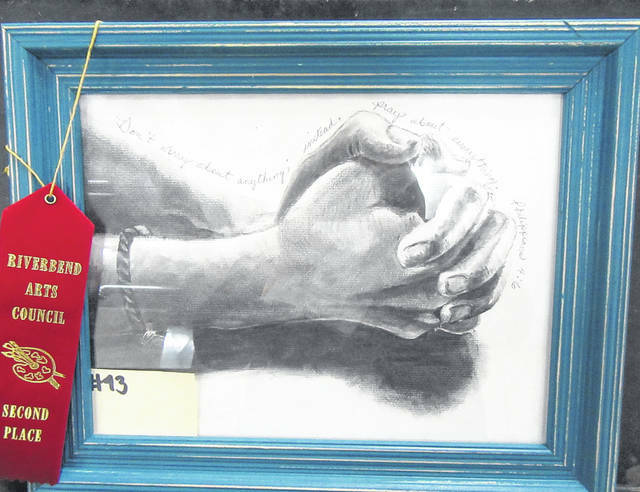 “Prayer Hands” by Chuck Lukowski took second place in the drawing category. In the “Think Outside the Box” competition the entry from the team of Everett Huggins, Julia Bancroft, Aura Bancroft and Enya Bancroft took first place. 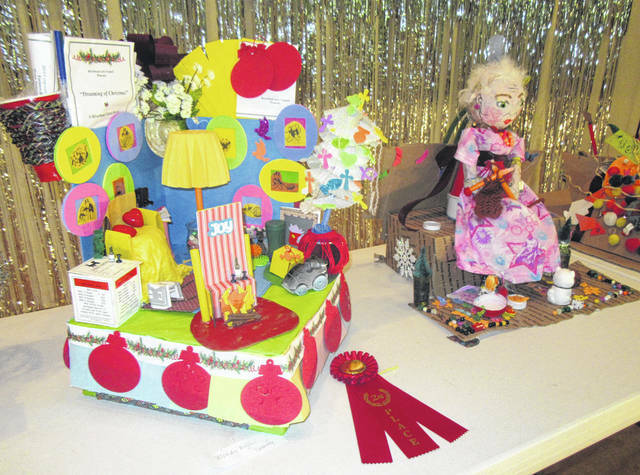 The entry by Wendi Miller took second the “Think Outside the Box” competition. 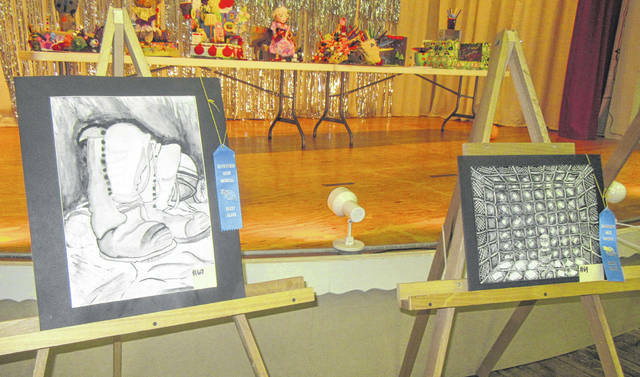 These award winning entries were on display at the annual Art in the Village show. 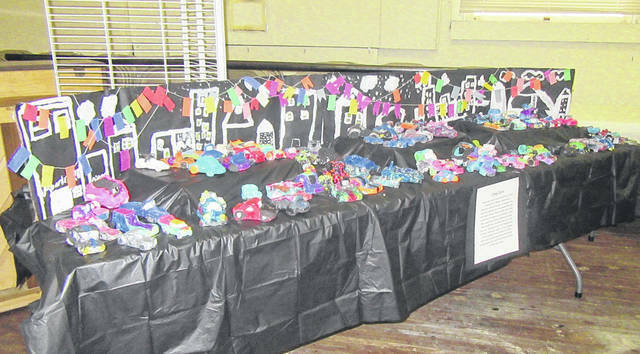 Clay cars were designed by local students for a display at Art in the Village. 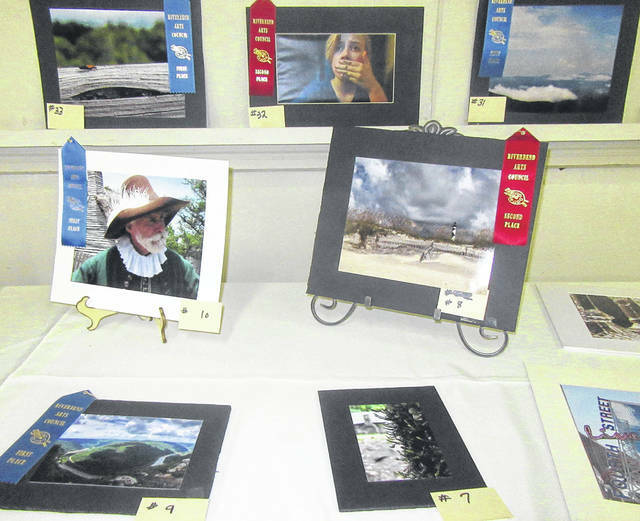 Award winning entries were on display at Art in the Village. “Country Roads Take Me Home” was an entry by Jane Oldaker. 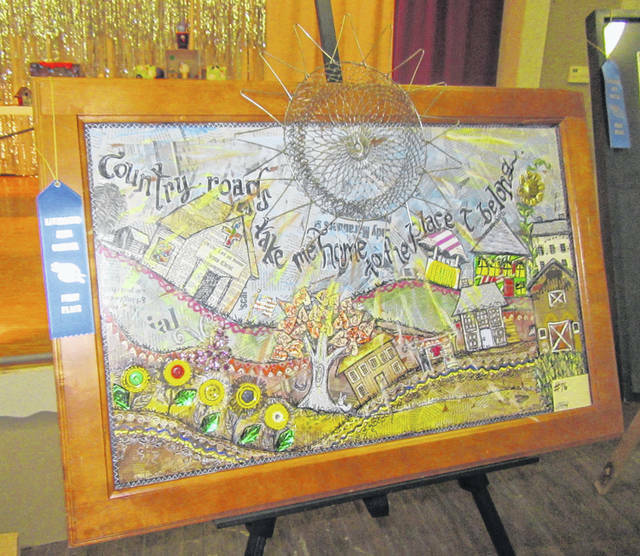 The mixed media work took first place. 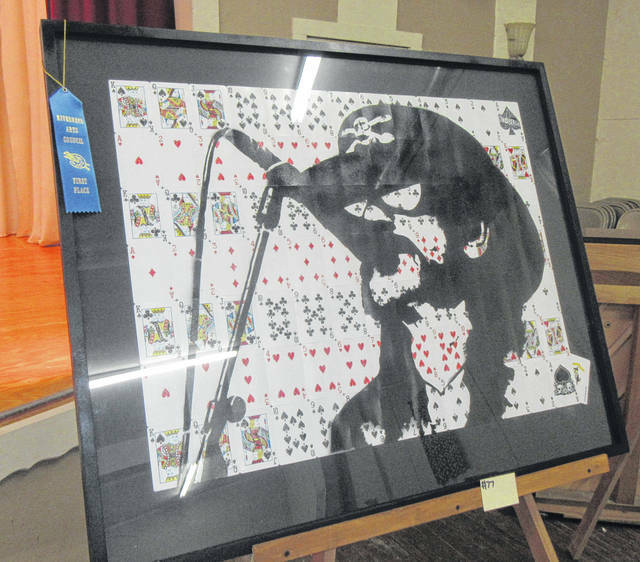 MIDDLEPORT — Paintings, drawings, photographs and more were on display last weekend as part of the annual Art in the Village event hosted by the Riverbend Arts Council. In addition to the art pieces on display, there were children’s activities, demonstrations by local artisans and more. 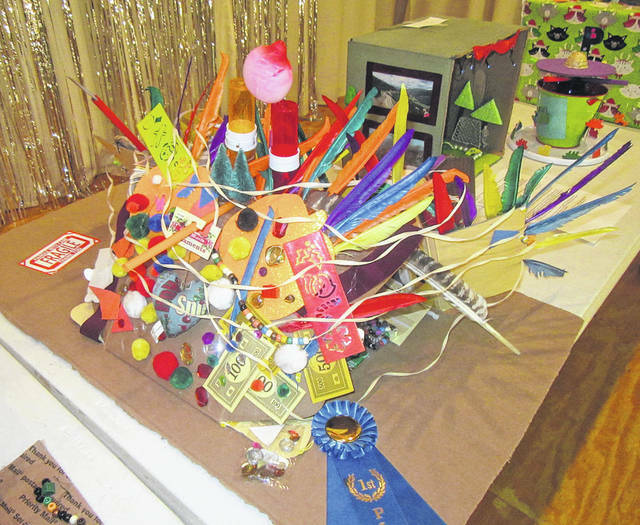 There was also a display from the “Think Outside the Box” competition, in which those taking part were given a random assortment of items to form into their own “masterpiece.”Clay cars crafted by local students were also displayed as part of the event. 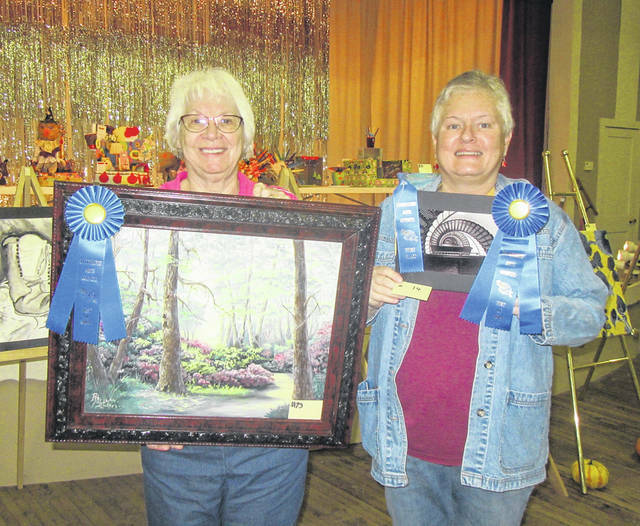 Rhojean McClure and Jennifer Harrison took Best of Show honors for their entries. McClure’s oil painting “Garden Path” was named Best of Show for paintings, with the acrylic painting of Ginger Potter titled “Blacks and Blues” as the Reserve Best of Show. In photography, Harrison’s photo in the “things” category was named Best of Show, with Peggy Crane’s entry taking Reserve Best of Show. 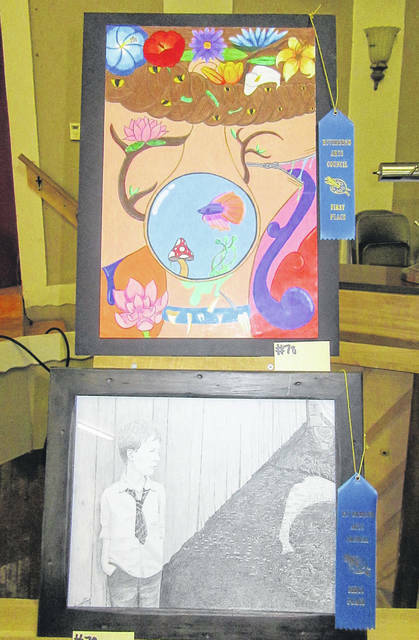 Category 1, Drawing — Amateur: 1st, Chuck Lukowski, “Slow Down”; 2nd, Chuck Lukowski, “Prayer Hands”; 3rd, Debbie Corder, “Garden Door”; Student: 1st, Jasina Will, “Stretching the Ear”; 2nd, Noah Patterson, “Outlook”; 3rd, Jasina Will, “What the Flock”. Category 2, Oil Painting — Professional: 1st, Rhojean McClure, “Garden Path” (Best of Show); 2nd, Carmen Schulty, “Tall Grasses in the Marsh”; 3rd, Jessica Ashley, “Gold Finch”; Amateur: 1st, Becky DeLong, “The Beckoning”; 2nd, Becky DeLong, “The Creek”; 3rd, Karen Werry, “Wintertime Meadow”. Category 3, Acrylic Painting — Professional: 1st, Bobbi Owen, “Following the Breeze”; 2nd, Ginger Potter, “Blacks and Blues” (Reserve Best of Show); 3rd, Jessica Ashley, “Golden Fields”; Amateur: 1st, Sharon Deem, “Under the Sea”; 2nd, John Bumgardner, “Meadow Delight”; 3rd, Charles Tate, “Strength in Hope”; Student: 1st, Halo Rife, “Woodland Camp”; 2nd, Halo Rife, “Splatter World”; 3rd, Peyton Ingels, “OU v OSU”. Category 4, Water Color Painting — Amateur: 1st, Eric Cranston, “Love”; 2nd, Charles Tate, “River Queen”; 3rd, Eric Cranston, “African Pattern”; Student: 1st, Peyton Ingels, “Hard Day”; 2nd, Hannah Crane, “Unicorn”. Color Photography, Places — Professional: 1st, Sharon Dean; Amateur-Snapshot: 1st, Jennifer Harrison; 2nd, Alexis Schoolcraft; Amateur: 1st, Jennifer Harrison; 2nd, Jennifer Harrison; 3rd, Peggy Crane; Student-Snapshot: 1st, Jazahera Moore; Student-Enlargement: 1st, Hannah Crane. Category 7, Black and White Photography, People — Professional-Enlargement and Snapshot: 1st, Angela Petrie; 2nd, Sharon Dean; 3rd, Sharon Dean; Amateur-Snapshot: 1st Alexis Schoolcraft. Black and White Photography, Things — Amateur-Enlargement: 1st Jennifer Harrison (Best of Show); Amateur: 1st, Alexis Schoolcraft. Think Outside the Box — 1st, Everett Huggins, Julia Bancroft, Aura Bancroft, Enya Bancroft; 2nd, Wendi Miller; 3rd, Hannah Crane.